Years ago, when this garden minder was a newly-minted employee at an off-campus study program, she noted a colleague’s withered, brown, desiccated and extremely dead cactus. “How on earth do you kill a cactus and why do you keep that thing?” queried the naïve childless young woman. “I don’t want to give my students the wrong idea,” answered the wise mother of three. As the pages of this blog testify, until recently, this tender was an involved and nurturing gardener. Dead leaves were snipped, pots were rotated to capitalize on the sun (or shade), water was hauled up the sladder to combat Philly’s brutal summers, compost was applied in an effort to fertilize organically, aphids were futilely combated, loopers were fed to nearby sparrows, and ailing plants were ruthlessly culled. This year, however, the Hurricane took up a lot of energy. And Plants On Deck, while neglected, thrived. 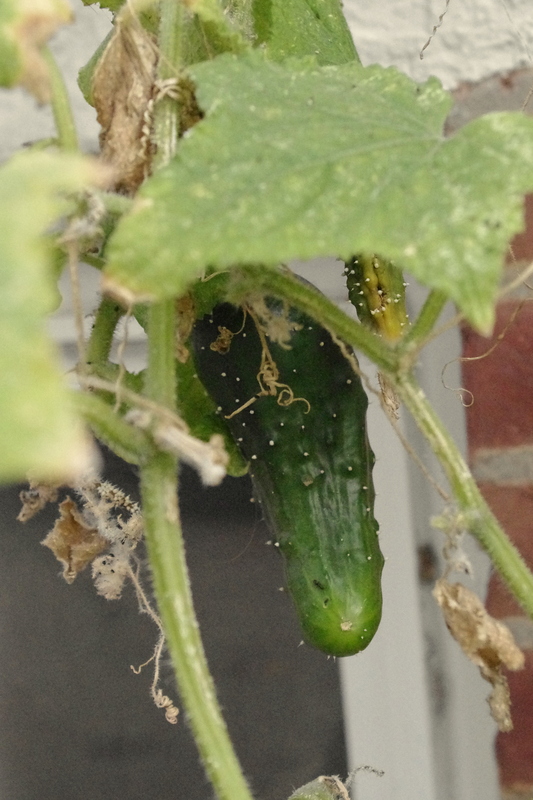 Aphids were ignored and withered leaves clung to the woody vines, but the aforementioned Hurricane was sent off to preschool with lunches stuffed with juicy cherry tomatoes and crunchy cucumbers (bitter skins removed). Endless containers of Swiss chard goma-ae were consumed. Crisp peppers were roasted and mountains of herbed chicken were devoured. It’s October now. And the Hurricane had a cucumber sandwich for lunch yesterday.